... ZORK: We need the biggest book about the Olympics in the universe, please. (Librarian reaches under her table and holds up book entitled 'The Biggest Book About The Olympics In The Universe'.) ... Read funny samples below. with roles for the whole class. 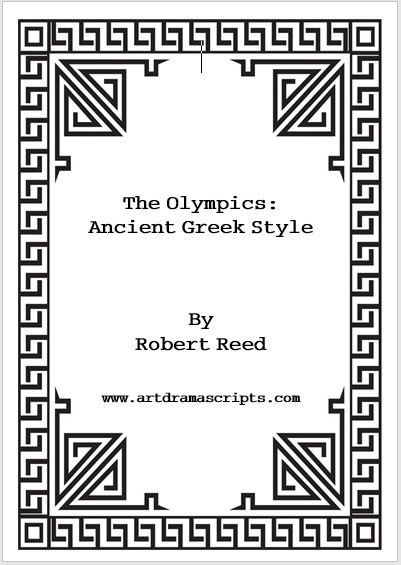 This humorous play takes a look at the weird and wonderful world of the Ancient Olympics. There were some unusual rules about who could attend and enter competitions, and cheese was viewed as a performance enhancing substance! The winner of the first ever Olympic Games -which only featured one event- was a cook. Watch out for an appearance by the daddy of the Greek gods, Zeus, in this play. There is a total of 28 roles; 6 roles are recommended for acting by girls, 4 roles are recommended for performance by boys. With doubling the play could be performed by 22 children (or possibly even fewer). This is an abridged version of the 20 minute play for smaller classes. The number of characters is 17 and with doubling the play could be performed by 12 children. The duration of the play is 15 minutes. The language has been adjusted and is suitable for Year 3 - Year 4 children (aged 7-9). This is a 30 minute version of the script. A few more jokes and 10 more minutes of fun. from elementary, through middle to high school. ZORK: Can you believe it, Zindy? After seventy years of working over-over time in Empress Min's plutonium hot dog factory we finally have two weeks holiday and we're going to Earth! ZINDY: Yippee! (Pause.) What's Earth? More ideas for a school assembly. ZORK: Welcome to London, host city to the 30th Summer Olympic Games. (Whispering.) This is Tower Hamlets library: it's where we are going to find information about the Olympics. EMPRESS MIN: Hey, earthling, I'm hungry! ZINDY: Do you think they noticed we were aliens? LIBRARIAN: Of course, you are. And, the man sitting behind me is Elvis. ZORK: We need the biggest book about the Olympics in the universe, please. LIBRARIAN: Yes, it's just in. You can sit there and enjoy it. (Pause.) But, no noise in my library, even if you think you're from a galaxy far away. EMPRESS MIN: Can I have a double cheeseburger with fries? ZORK: (Opening book.) The first chapter is about the history of the Olympic Games.